The County Superintendent, C. R. Westcott, formed School District #36 upon a petition of B. J. Cochrane and seven others, in the county of Deuel, Territory of Dakota, in 1882. The first meeting was held at the home of Sydney Oliver. First officers were: B. J. Cochrane, temporary chairman; C. C. Robinson, clerk; O. J. Oliver, director; B. J. Cochrane, treasurer. A site was chosen for the school house and the decision was made that it be 14 by 16 feet and 8 feet high. It was decided to levy a tax of one percent for the purpose of paying interest on school district bonds, a tax of one and a half percent for teacher's wages, with a tax of one half percent for contingent fund. In 1885 it was decided to have five months of school, B. J. Cochrane was to furnish the wood for $6. In 1887 it was moved that a coal stove be gotten, providing they would get trusted for the bill - failed to get trusted. In 1888 six months of school were held in the home of B. J. Cochrane and he furnished the room and stove free of charge. In 1910 problems arose over the distance of some of the students from the school house and the county superintendent and the board met to discuss the question. After lengthy debate, a special meeting and a vote resolved the issue. There were 18 votes in favor of moving the school house and 16 against. The school house was moved to a site one mile east. In 1912 a ninth grade was added along with a nine month term of school. The enrollment for this term had peaked at 35 pupils. Again came the need for a bigger and better school house, one with two rooms. L. R. Otterdale was hired to build and furnish the materials at a cost of $1680.00. Two teachers were hired and subjects were offered through the tenth grade. Those first teachers in the new (present) building were Alma Aamold and Marie Ostroot. At one time there were 53 pupils in the two rooms. The upper room had grades six through ten. It was about the time of the term of 1913-1914 that a teacher had a contest for a name for the school and Louis Severson's entry "Spring Dell" was chosen, named for the spring down in the dell north of the school house. Those hills around the school house offered some of the best coasting in the area, and the south slough was always there for ice skating. Now to relate some personal stories about school days at Spring Dell. There is the story of a teacher who could not handle the pupils. One day they took her chair down to the ravine. The kids even walked on top of the desks to class. She had to be replaced by a man teacher. He came in to have discipline. The first day he showed the kids what a good shot he was and laid the revolver on his desk. He had discipline! Also in the earlier days there was an east-west feud. The kids even tried lynching one another out in the barn, or so the story goes. It must have been tough for some children when they heard only Norwegian or Swedish at home. One teacher in her remarks said of the children of a family, that they were poor in reading because they insisted upon studying in their own language at home. But the father in that home also learned to read English by sitting up until mid- night reading the children's school books. Evadna Cochrane Burba tells this story: "Mr. Kendrick was my seventh grade teacher; he was so handsome I think all of us girls were secretly in love with him. During his year, a terrible blizzard blew up in the afternoon. Only the Udesens got home; their father happened to be driving by about the time the storm struck and his children were dismissed to ride home with him. The rest of us had to spend the night. We formed a human chain to plow through drifts to the Kendrick's house for supper. There were almost 40 of us in the two rooms at that time. Poor Lois Kendrick must have scraped the bottom of the barrel to feed us. After supper the boys and Mr. Kendrick went to spend the night in the school house; the girls stayed at his home. I remember five of us slept across one of the beds and that we had pancakes for breakfast. The boys ate what was left in dinner pails for their breakfast. Fortunately the day dawned bright and clear and although we couldn't see the Kendrick barn (the place just west of the present school building) from the house because of drifts, our parents one by one came to take us home." There was one young man who taught who had just one session of Summer School training and he could not handle the children. They tied him up a time or two so they could have a longer noon or recess. They snowballed him 'til his clothing was wet. They even made bows and arrows from twigs, string, and used nails for arrow points and shot at him. Seventy teachers taught in Spring Dell in its 85 year history. After the new school house was built, two teachers were hired beginning with the 1916-1917 term through the 1927-1928 term. Classes were held in each of the two rooms. The upper grades were similar to present day Junior-High with some high school subjects taught. 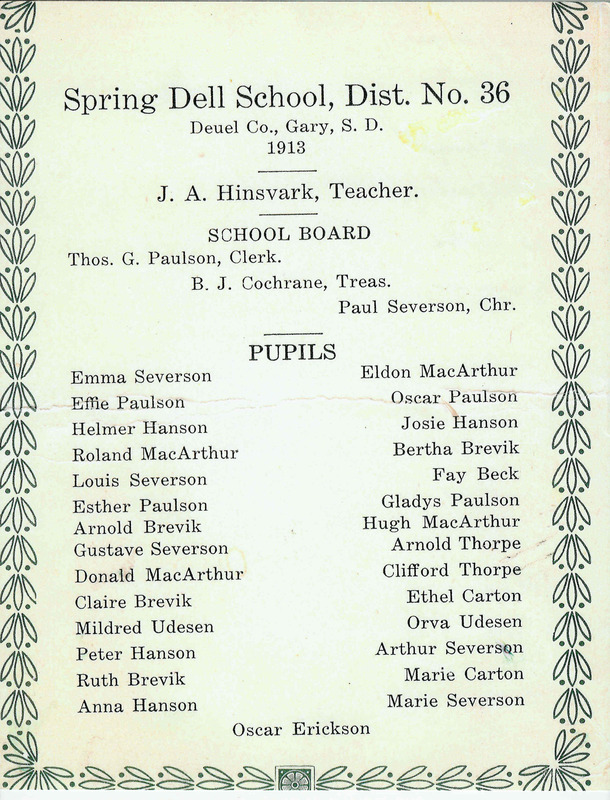 There were three ladies, namely, Esther Paulson (Solberg), Viola Carton (Thorpe) and Marie Severson (Lunde) who were pupils at Spring Dell and later returned to teach school there. At the beginning the teacher's salaries were as low as $25.00 per month. In 1966-1967, the last year the school was in session, Lyndon Hoseck received the highest salary paid - $255.00 - and only had four pupils to teach. Changing times! 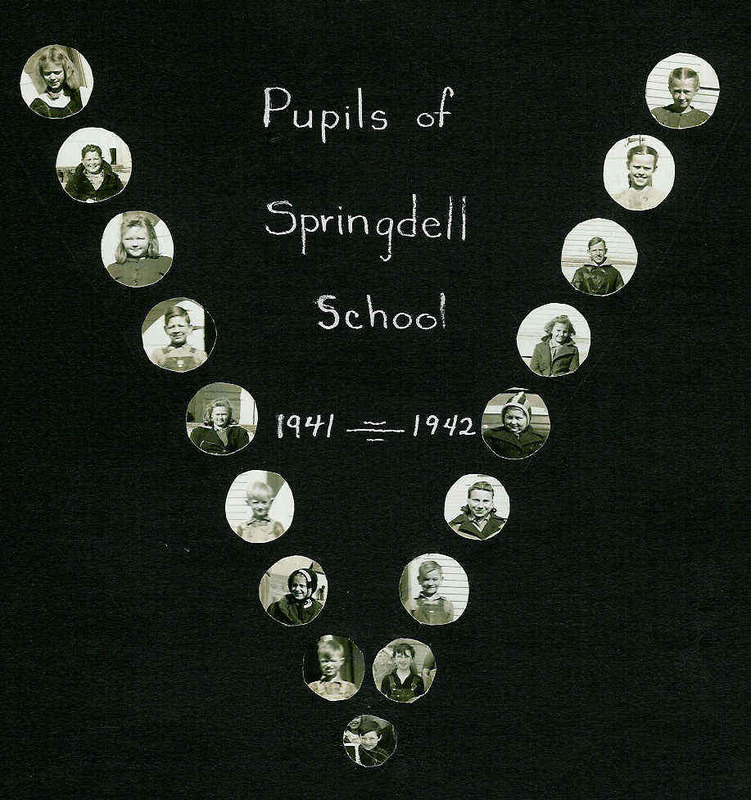 The teachers at Springdell were Fannie Stanley, Alice Walker, Mary Bower, Emma Gamble, Agnes Cochrane, Vina Bixby, June Oliver, Gusty Reyerson, Gertie Barlow, Frances Herrick, Mina McGilvia, Emma Wells, Pearl Hopkins, Allice Jennings, Maud Troupe, Daisy Kerr, Joy Knight, Anna Eggen, Lena Herrick, Ida Paulson, Hattie Wells, Bessie Bradley, S. Shelstad, Emma Fuller, Florence Paulson, Clara Iverson, Agnes McGill, C. Hinsvark, Emma Larson, J. Hinsvark, Alice Bentley, Ruth Pate, Mathilda Peterson, Alma Aamold, Marie Ostroot, Emma Rasmussen, Ella Peterson, Minnie Helgerson, Clara Eikamp, Nellie Carton, Ethel Kerr, C. Kendrick, Esther Paulson, C. R. Hoy, Alta Risdahl, M. VanOsterlou, Emma Langemo, Cora Lunde, Alvira Kipp, Lorraine Shelstad, Mrs. S. Peters, Myldred Mork, Marie Severson, Viola Carton, Grace Howell, Catherine Cole, Lucille Harding, Darline Peterson, Bernice Saeger, Kathryn McLain, Myrna Kjenstad Han- sen, Mrs. J. Rogness, Marie Nannestad, Myron Walburg, LaVonne Severson, Lena Hunt, Marjorie Torgerson, Helene Granner, Lyndon Hoseck. The school house and all the property was sold at an auction sale in 1970. The John Lentz family bought the school house for $200. The land went back to the original farm now owned by John Lentz. His son Luther and his wife Ann had the school house remodeled and it is now a lovely home for them and their son, John Charles. I spent the first eight years of my education at Spring Dell District # 36. 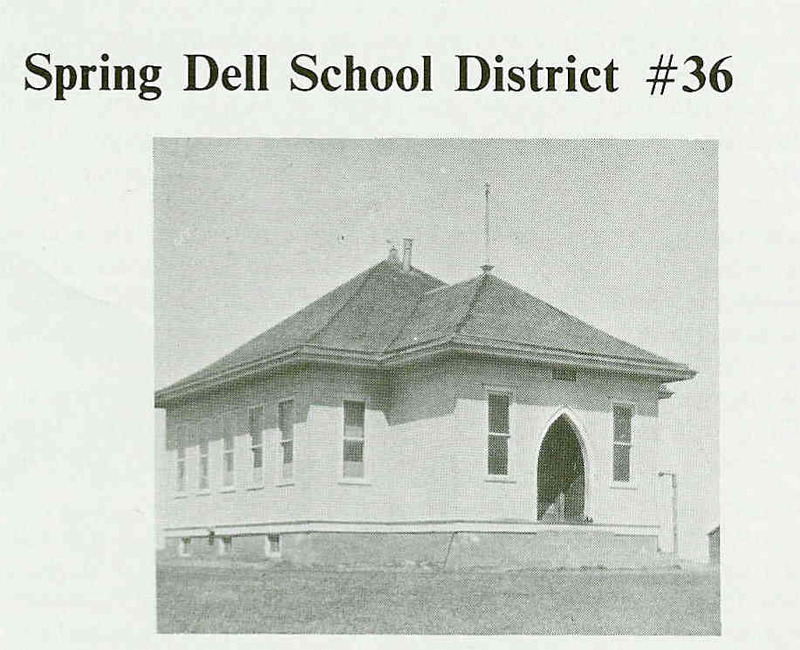 Spring Dell being a Deuel County country School. We had one teacher for all eight grades. By absorbing arithmetic, reading and other classes of the upper grades we also learned their lessons. The students today do not have that opportunity with each grade having a separate room. I did not need Physical Education classes like they have today. I got my exercise by walking 1 ½ miles to and from school each day. My Dad would hitch the team Pat and Butte to a sleigh. Pat, a beautiful black horse and Butte, a dapple gray horse. I still remember the smell of sweat and wet leather as I rode in the sleigh over snow drifts that were as high as fence posts as Dad drove me to school. Then one day Dad reminded me “You are in third grade now and old enough to walk to school”. The teachers in rural schools wore many hats. The teacher had to come early in the morning to start the coal furnace. There had not been any heat all weekend in the school house, making Monday mornings bitterly cold. Walking to school in winter meant I had to be all bundled up. Being cold when I started walking from home I wore a knitted hat, wool scarf, winter coat, mittens and overshoes. I even had to wear long brown cotton stockings. When I arrived at school my clothes were all wet with sweat. I shivered all Monday morning and my legs felt cold and clammy with wet cloths in a cold school house. I carried my dinner to school in a lunch box. The lunch box sat in the cold entry. By dinner time the bologna sandwiches were frozen. The chocolate cake with thick creamy chocolate frosting smelled delicious! My thermos bottles held piping hot vegetable soup which tasted so good. Maria Holen, the County Superintendent of all Rural Deuel County Schools visited all of the country schools. No one knew when she was coming. All of a sudden we heard her loud deep bombing voice in the school. It made me alarmed and I would sit quiet. It got so quiet I could hear the racing of my heart. Then we students started to whisper to each other. I shall cherish my days going to Country School. I feel privileged to have had the opportunity of going to Spring Dell Dist. # 36. There are pictures on page two. Just click on the red title at the top of the first picture and it will take you there. Can you identify any one there that does not have a name. If so, just email us at rstbaer@itctel.com . Thank you.